How do I conduct research on someone who attended McGill? How can I find contact information on a former classmate? Am I a direct descendent of James McGill? What are the birds on the McGill coat of arms? Where can I find information on McGill campus buildings? Did a McGill student accidentally kill Harry Houdini? Did "Jack the Ripper" attend McGill University? How can I request a copy of a photograph that I found in the University Archives' Photo Collection Database? 1. How do I conduct research on someone who attended McGill? Use our website to search for photographs and other records. You can also submit a request to the University Archives indicating the student's name, whether or not they graduated and if applicable year of graduation. University Archives staff will search the student yearbook (Old McGill), scrapbooks, and other sources not accessible through the website. 2. How do I find contact information on a former classmate? The University Archives does not have access to this information--contact your alumni representative OR the McGill Development and Alumni Relations office (via the Alumni relations website) for resources enabling your class to keep in touch. NOTE: Enquiries received regarding "contacting" others will not receive a response from this site. 3. Am I a direct descendent of James McGill? Not likely. According to Dr. Stanley Frost, citing research conducted by two prominent McGill family genealogists, James McGill III, the founder of McGill University, died, like his siblings, childless. Other relatives, most notably uncles George, John, David and Ninian, may have had children who emigrated to North America, but the University Archives does not have any information on their last whereabouts or their descendents. In James McGill's own words in a 1795 letter to a friend, he wrote, regarding children: "I have none of my own." 4. What are the birds on the McGill coat of arms? The three birds that appear on the coat of arms are Martlets, imaginary birds steeped in heraldic myth. The birds are legless, a symbolic representation of their perpetual state of flight. In 1922, under the direction of Principal Sir Arthur Currie, the McGill University Coat of Arms underwent some changes, with the addition of the open book, the two crowns, and the University's motto ("Grandescunt Aucta Labore" - By work all things increase and grow) as well as James McGill's personal motto ("In Domino Confido" - I trust in the Lord). That same year, the coat of arms (see image) was patented by the Garter King-at-Arms in London. In 1956, the matriculation of the coat of arms was granted by the Lord Lyon King-at-Arms in Edinburgh. In the ensuing decades several vulgarized versions of the coat of arms proliferated in and around campus until 1975, when the Board of Governors convened and settled upon a single standardized look for the coat of arms that is still in use today. 5. Where can I find information on McGill campus buildings? Virtual McGill: Campuses and Buildings is a comprehensive on-line resource developed by the Canadian Architecture Collection (CAC McGill) using resources of the McGill University Archives. The site explores the history of McGill University from the perspective of its built structures. Site includes photographs, drawings, and information about the buildings and the personalities behind them. 6. Did a McGill student accidentally kill Harry Houdini? 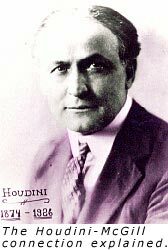 Tragically, on October 31st, 1926, the famous magician and illusionist Harry Houdini (born Erich Weiss, Houdini changed his name as a tribute to French illusionist Jean Eugene Robert-Houdin) died from peritonitis, a severe inflammation of the abdomen region caused by a ruptured appendix. Jocelyn Gordon Whitehead was registered at McGill University in 1926, which places him in the correct time period as Houdini's appearance at the University. However, he does not appear as a graduate of the University. 7. Did "Jack the Ripper" attend McGill University? It is difficult to conclude whether a McGill-trained physician, Dr. Thomas Neill Cream, who was convicted and charged with murder, was, in actuality, the infamous nineteenth century serial killer "Jack the Ripper." In 1872, Thomas Neill Cream enrolled at McGill University in the Faculty of Medicine. An average student, Cream, nevertheless, wrote his doctoral thesis on, curiously, the topic of chloroform, a poisonous substance in high doses. He earned his degree of Doctor of Medicine and Master of Surgery, and began to practice his profession. In 1876 he married Flora Brooks, who died a year later from what one report called "a lingering illness." Dr. Cream continued to practice medicine and improve his skills, sometimes traveling abroad to better his education. But in his wake, he left behind him a trail of death, his victims (all female, mostly prostitutes) having succumbed to the deadly effects of chloroform. His killings, however, would soon come to an end. In 1891, while studying in England, Dr. Cream was arrested and charged with the murder of a London prostitute. He was sentenced to die by hanging, and in 1892 his execution was carried out. Dr. Cream was a killer, without a doubt, with or without the "Jack the Ripper" association. But some researchers, most notably Donald Bell, believe that Dr. Cream and Jack the Ripper shared similar traits, similar criminal modus operandi, leading them to believe that Dr. Cream and "Jack the Ripper" were the same person: both chose prostitutes as victims; both wrote letters to authorities boasting about their evil deeds; both were very cruel and merciless; and their victims, as if intoxicated, nearly never cried out in fear. From these similarities, Donald Bell is convinced that Jack the Ripper was in fact Dr. Thomas Neill Cream. 8. How can I request a copy of a photograph that I found in the University Archives' Photo Collection Database? The McGill University Archives Digital Services can provide digital scans of photographs held in our collection. Those wanting a digital copy of a photograph should submit their request to refdesk.archives@mcgill.ca, quoting the file number (e.g. PR042325). Please inform us of any digital imaging details such as preferred resolution and file format. Please contact the University Archives reference desk for information regarding copyright, permission, and service rates.